How big does your stack of cookbooks next to your computer get? Mine usually teeters precariously before I put a few away. It doesn't take long for it to build back up, though...sometimes just a matter of minutes as I spot one on the shelf that I must pull back out and peruse. My current pile...okay, my pile 2 days ago (it's been switched up a bit since)...screamed photo-op, sitting there all serene in front of the window with its Red Stripe all cozied up next to it. Which was light by the way. I don't usually drink light beer, but I thought I'd try it...it was good. All the pungeant skunkiness of regular Red Stripe. Hey...we do what we can, right? Hmmm...can you tell who our current IHCC focus is?? His will probably occupy that pile for another 5 or so months...with rotating company. What's in your current pile? Well, (she says, sanctimoniously) I have no stacks of cook books anywhere near my computer! Lately there has been only one cookbook... La Cucina! But that is because I have a bookcase next to my computer that holds the other cookbooks that are not currently in heavy rotation. Oh wait I forgot about the pile on chair over there. Its funny because my mom always said, "You can never have to many shoes." I agree 100% on that but would have to include cookbooks in that thought. I have all of Ina Garten's cookbooks and use them often. I like her gracious style of entertaining, but prefer to leave out some of the butter and cream she uses so often. I also have several of Bobby Flay but my husband is the griller, not me. Honestly, I have way way too many cookbooks and I have a few in a pile to take to the resale store. When I give one away, I feel like I'm parting with a part of me. I'm a sucker when it comes to books. I want to get one Mark Bittman cookbooks! I just cleared my desk of the teetering piles after I got the iron eye from husband but next to my dictionary, thesaurus, French-English dictionary and often the French-English cooking dictionary I have 1 or 2 macaron cookbooks, Better Homes & Gardens, 1 bread book like King Arthur's, and depending on whether cooking or baking 2 or 3 cake cookbooks, dessert cookbooks or a Nigella Lawson, a Vegetarian Epicure, Claudi Roden and a couple Saveurs. Figures you finally come back and now I haven't had time for blogging, ack!! I cleaned up my desk of the pile that's been building up since January. hahaha... Let's see there were a couple cookbook one on BBQ and one French cuisine. A couple history books for research countless papers and notebooks. I can already feel it building up again. Hmmm, all I can think now is 'Red Stripe'...and how good you are in the kitchen! 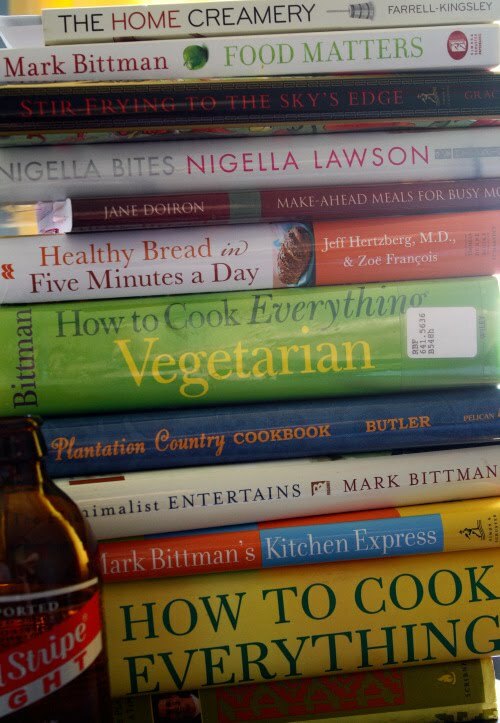 I'm pretty good and keep my stack of cookbooks in the kitchen. Mostly because there's no room in here. Heh. Yep, Bittman does seem to be in control of that pile! This photo looks like you were visiting my office. I haven't counted.... but I have at least 30 cookbooks tettering around me. My cookbooks are in a cabinet in the kitchen. I don't use them nearly enough. :( I feel bad about it, though! haha...guess i'm not the only one. I think i have HBin5, MtAoFC, Betty Crocker, a few everyday food mini mags, prevention (not sure how that ended up there), Costco cookbook, and a few "wok" cookbooks. Then there's all the printed recipes from the internet, and scribbled recipe "notes"...and the mess goes on and on. I love this post Heather! I always have a stack of cookbooks out too. I usually have a pile by the side of the couch and then a smaller pile under my bed. How is that vegetarian book? I think I might want to check it out.